Fifteen-year-old Jackie Stone's father is dying. When Jackie discovers that her father has been diagnosed with a terminal brain tumor, her whole world starts to crumble. She can't imagine how she'll live without him . . .
Then, in a desperate act to secure his family's future, Jackie's father does the unthinkable--he puts his life up for auction on eBay. Jackie can do nothing but watch and wait as an odd assortment of bidders, some with nefarious intentions, drive the price up higher. The fate of her entire family hangs in the balance. But no one can predict how the auction will finally end, or any of the very public fallout that ensues. Life as Jackie knows it is about to change forever . . . 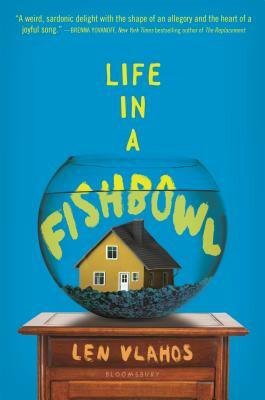 In this brilliantly written tragicomedy told through multiple points of view--including Jackie's dad's tumor--acclaimed author Len Vlahos deftly explores what it really means to live. "A weird, sardonic delight with the shape of an allegory and the heart of a joyful song." "Surprising, original, political, and deeply affecting . . . It is one of those rare works of art that keeps you guessing up to the very last page." "It will tear you apart, and yet it's an absolute joy." Len Vlahos dropped out of NYU film school in the mid '80s to play guitar and write songs for Woofing Cookies, a punk-pop four piece that toured up and down the East Coast, and had two singles and one full-length LP on Midnight Records. After the band broke up, he followed his other passion, books. He is the author of The Scar Boys, a William C. Morris Award finalist and a #1 Indie Next pick, and Scar Girl, the book's sequel. Len lives in Denver with his wife and two young sons, where he owns the Tattered Cover Book Store.